There has been a lot of bad media about how all the old wooden power poles with no fire protection are causing additional loss in wild fires. The Issue with these old wooden poles is they snap at the ground in high winds, especially when there is dry brush burning at the base. 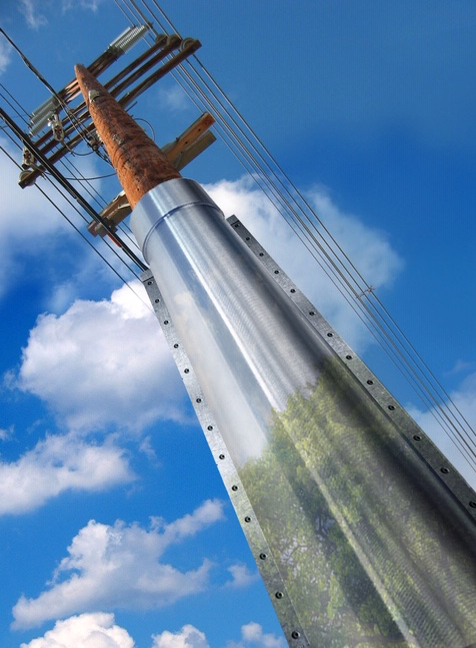 What M-Fire Pole Armor does is it adds wind load shear value by digging the armor in below the ground two feet and it adds big fire defense ten feet above ground. Until we address the many design flaws in many older western region communities, we are not finished racking up historical wild fires losses. Our government needs to step in now while we get a break from rain, just as they did soonafter the Northridge Quake by retrofitting the freeway overpasses. If we do nothing now and wait then it’s to late, because next years wild fires will show up no matter what. Al Gore can say its Climate Change but what is more important now is that we address the unmanaged dry fuel and all the design flaws in many older communities that makes them all so vulnerable.